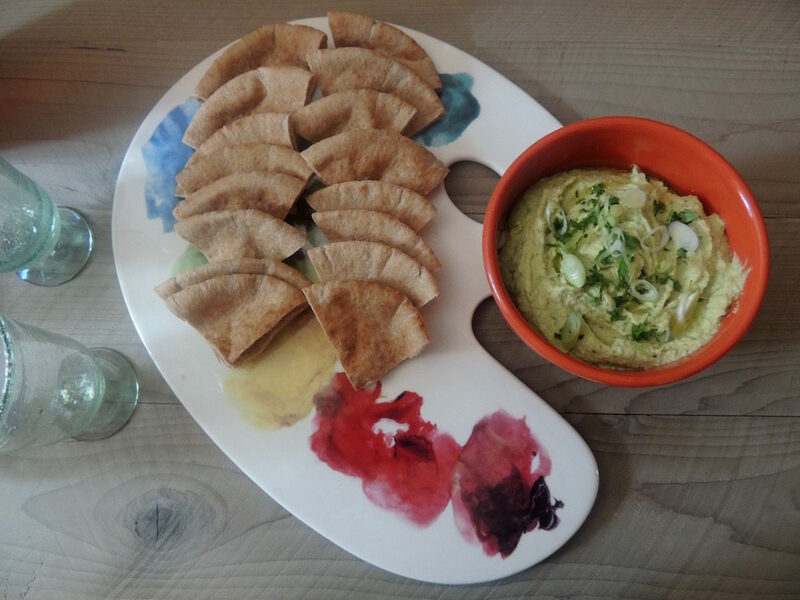 Riverbank Farm, a vendor at the Westport Farmers’ Market, makes delicious dips and spreads, including a scallion parsley humus. Their version is quite lemony and includes garlic. The first time I made the recipe I left out the garlic because we had a couple of guests don’t tolerate it. I used 2 tablespoons lemon juice, more subtle than their version. I really liked it without the garlic and less lemon juice; the scallions are more prominent. The nice thing about humus is this simple chickpea puree can be dressed up in so many ways. The tahini and just a little cumin provide that familiar underlying humus flavor, and the scallions and parsley give it a new spin. Make at least four hours in advance or overnight before serving to let the flavors meld. Serve with raw veggies or slices of pita bread. This makes a great pita sandwich, too! 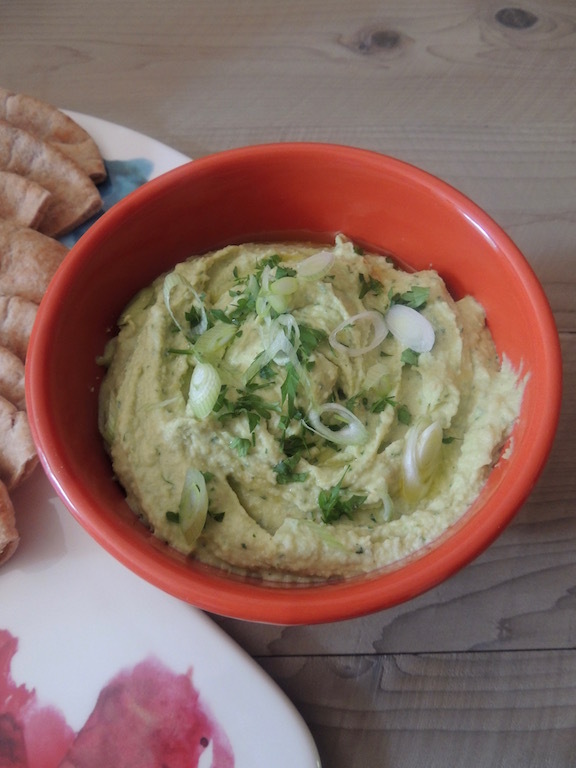 A little twist on a classic humus recipe with scallions and parsley. A quick and easy recipe. Serve with pita slices and/or fresh cut veggies! Garnish: a little drizzle of olive oil with a little chopped parsley and/or thin slices of scallion. Place the beans, tahini, scallions, parsley, lemon juice, olive oil, salt, cumin and cayenne in a food processor fitted with the blade attachment and puree until very smooth. Scrape the sides of the bowl a couple of times. Place in a serving bowl and garnish with a drizzle of the oil, chopped parsley and/or sliced scallion.